The city of San Jose lies 50 miles south of San Francisco in the southern portion of the San Francisco Bay Area. It is located in the Santa Clara Valley, surrounded by the Santa Cruz Mountains to the east and the Diablo Range to the west. San Jose is the third largest city in California, and the tenth largest city in the United States, with a population of just under one million. It is also the largest of a number of cities composing the region known as "Silicon Valley" for its strong presence in the information technology arena. The region was originally inhabited by the Native American Ohlone people for over 1,000 years until the arrival of white settlers. In 1777, San Jose was named El Pueblo de San Jose de Guadalupe and became the first civil settlement in Spanish California. After California gained statehood, San Jose briefly served as its first capital from December 15, 1849 to May 1, 1851. San Jose first developed as an agricultural center and was home to many orchards and vineyards. Eventually, urbanization covered the farmland with concrete, strip malls and housing developments, and California's primary location for wine production moved to the Napa Valley. 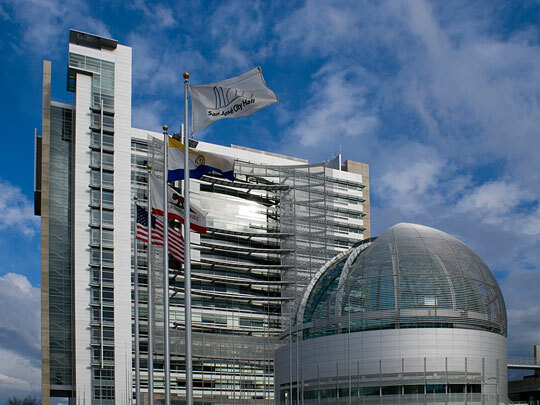 San Jose Government - official City of San Jose website. San Jose Weather and News - current weather in, and recent news about, San Jose. San Jose Product and Service Guide - San Jose enterprises. San Jose Area Schools - San Jose educational institutions. Santa Clara County Gov't - official Santa Clara County website. In-depth San Jose information and news can be found on these regional San Jose Libraries and San Jose Newspapers pages, respectively.